Calligraphy first appeared in China and as a style of writing has become a popular practice throughout the East Asian culture. In East Asia calligraphy is considered as a component of the asian wall art and décor, and it remains an important art and a subtle form of painting. The purpose of calligraphic painting is to strengthen the emotional impact on the reader by the thoughtful correspondence of the calligraphic handwriting to the semantic and literary-style content of the written text. Being one of the most mysterious art forms, asian calligraphy embodies the "way of writing", and in medieval culture the degree of mastering calligraphy was considered an indicator of the education, intellectual and spiritual development of the individual. In the East-Asian calligraphy, an ink and brushes for writing are usually used. With a few movements of the brush, an experienced master calligrapher can fix a fleeting mood, rhyme the quatrain that has flashed through in the enlightened consciousness and in a moment create an art object worthy of in-depth contemplation by many generations. The art of writing has always occupied an extraordinarily high place in the Arabic, and then in the islamic calligraphy art, which originated from the Koran's copying, so the written word itself became sacred. Many religions use different images, icons to express the basis of their beliefs, Islam instead offers calligraphy. 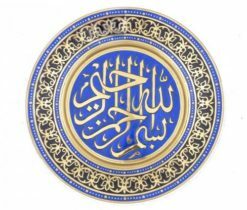 On our online-shop you will find items of islamic calligraphy art for sale, which includes calligraphic wood carving in the form of panel, chased plate or chased calligraphic carving of rectangular shape, calligraphy on the skin and paintings on the silk and plain paper.